So, I'm buying a sewing machine. After six hours of trying to sell curtains yesterday, I only managed to sew two hems and came away with an aching back and cramped fingers. It's going to take even longer to finish the rest of the first curtain, nevermind starting the other two. 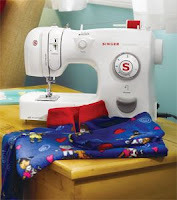 If you have a sewing machine to recommend, PLEASE DO!! So far the Singer® Inspiration 4205 looks like the best machine. It's supposedly great for beginners and is simple to use. Textiles aren't exactley my forte, so basic is great for me! I'm also going to enroll in a basic sewing machine class at Jo-Ann Fabrics so I can figure out how to use the silly thing. Hopefully I learn quickly so I can finally have curtains!